Nestled amid a grove of stately old trees, Tim and Leslie Reeves have spent the last 12 years lovingly restoring this historic adobe hacienda. 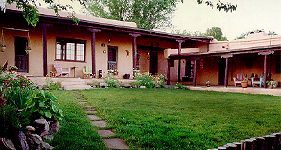 Situated on 7.5 acres on a rise overlooking Taos, and within two miles of the plaza, this Bed and Breakfast offers spectacular views in a rural setting. All of the cozy rooms and suites have outdoor entrances, private baths with hand painted tiles. 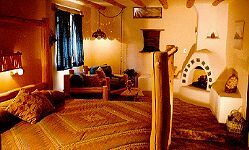 The true spice of the southwest is reflected in every quiet corner of this romantic and spacious property. Breakfasts are freshly baked and delicious; fireplaces abound. A hot-tub awaits you under starry skies. Comfortable beds and the best fresh-ground coffee. Friendly hosts who are outdoor enthusiasts help guests with a wealth of local information. Children okay. 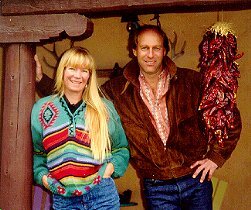 So take your blue jeans and jokes and get ready to experience the enchantment of Northern New Mexico from this special Taos hideaway.